Click Dup button to open a copy of selected camera settings for editing. 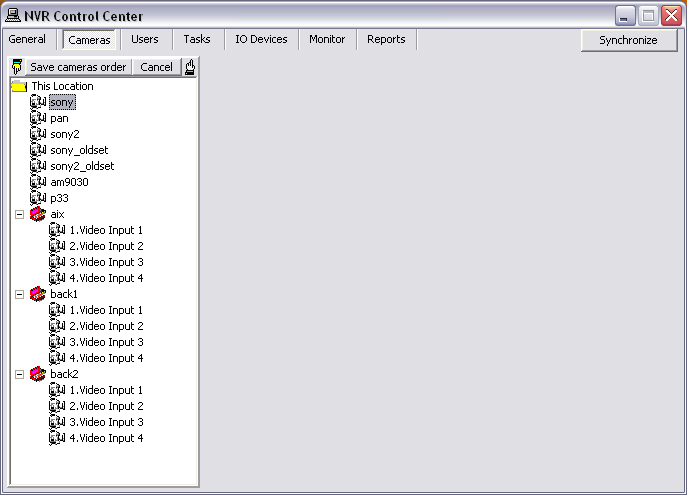 Under the Cameras Settings enter a descriptive name for the camera/video server into Name input field. From the Type drop-down list, choose camera/video server type. Type camera IP address and port number into Address input fields. If camera is already installed, click Determine camera driver button to allow the NVR auto-configure the driver to be used for communication. 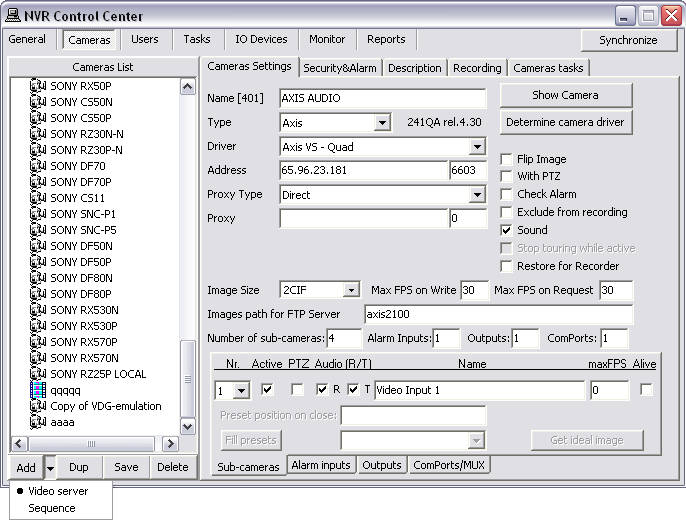 If camera has Pan/Tilt/Zoom capabilities, With PTZ checkbox must be checked to enable them in the NVR and Client. Switch to Security & Alarm to setup security settings. Click Save button to save camera settings. Auto-configured camera driver gives the NVR more specific information about the camera enabling better resolution and bandwidth control. If you choose the driver from Type drop-down list, the resolution information will be more generic and bandwidth control will not be as efficient. When a camera is installed and setup you can test the camera connection by pressing Show Camera button — a test window showing live video should pop up. Test window doesn’t show a high resolution image; it simply proves a connection to the camera. There must be direct access to the network camera IP Address and Port from the NVR. Make sure any personal and hardware firewalls between them allow for bi-directional communications for this IP Address and Port. With the camera selected switch to the Security & Alarm . Under the Names and Passwords enter usernames and passwords. They should match the users that are defined within the camera. 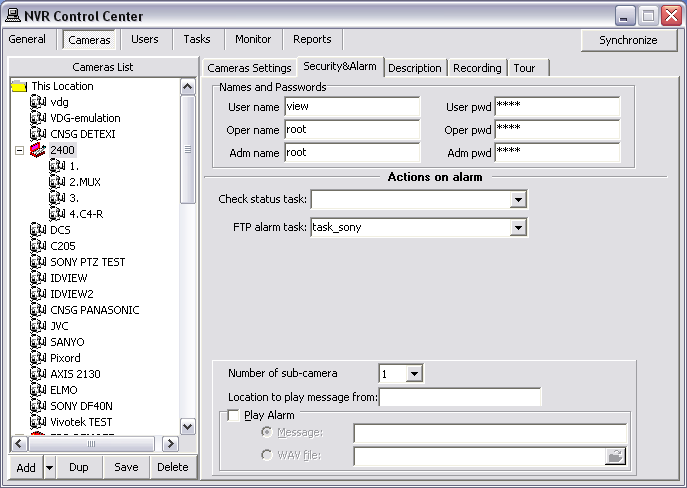 In most cases, camera will only have one username and password by default, with administrative privileges; in this case enter Adm name and Adm pwd accordingly. Click Save button to save settings under the Cameras List. It is really important to give a camera full and meaningful description. When an alarm event occurs, the information will be used to provide specifics to a real-time operator. With the camera selected switch to the Description . In the NVR Control Center — Cameras double-click on the top bar of the Cameras List — the bar will accommodate Move Down, Save cameras order, Cancel and Move Up buttons. Select a camera to move. Use Move Down/Move Up buttons to change the order. Click Save cameras order button to save the order or Cancel to return to previous.